There are six known species of Flamingos in the world. They are distinctive in their characteristics to not be categorized with other types of birds. Yet we do recognize that they have plenty in common with heron, ducks, geese, and other types of birds. There is no mistaking the unique design of their peculiar bodies though. While many other types of birds look graceful, this one tends to seem awkwardly put together. First there are the extremely large legs that you don’t usually see on birds. Then there is the amazing display of colored feathers. They include variations of white, pink, red, and orange. Underneath these wings are black colored. They are very vivid and that makes them something that people easily identify when they see them in zoos, on programs, or in books. The coloring for the Flamingo isn’t natural though. This is why the offspring are white and gray for the first couple of years. 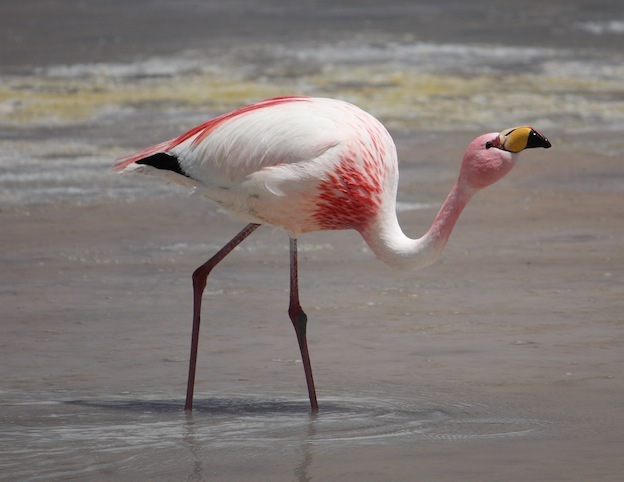 The coloring for the Flamingo species comes from their food sources. That is why some of them are bright and others are quite pale. It all comes down to the types of food they have access to in a given location. This type of pigmentation is added to their food at zoos too so that they don’t lose their lovely coloring. All species of Flamingos are filter feeders which means they take in food along with water. They do need to consume plenty of fresh water so if they are feeding from saltwater than that has to be removed from their bodies. Flamingos are extremely social animals and live in very large colonies. The various species tend to get along well too when their habitats cross during migration, the search for food, or when they are placed in captivity. They use a variety of sounds that are similar to the honking of a goose to communicate with each other. They also engage in various non verbal actions which are always interesting to humans watching them dance around. Mating takes place in pairs and this is one animal where both parents work hard to make a safe environment for their offspring. The size of the eggs varies by species but the incubation period is about 30 days for all of them. Mating is determined by the amount of rainfall and the availability of food. Once mating occurs nests are made from items in the area. They take turns keeping the egg warm and then going to find their own food. Both of the parents are able to create milk to feed to the offspring for the first week of life. It is believed that the making of this milk is triggered by the cries of hunger from the offspring. There is still a great deal that we don’t know about the various species of Flamingos out there. However, what we do know is that they are calm animals and that they often live in the areas where not many other creatures do. They also fall victim to various types of prey including large cats, coyotes and other types of dogs, and even large snakes. Their natural habitat continues to be depleted though due to destruction by humans. This is a common enough practice that have many conservation efforts out there have been working to protect. That way they can continue to live very long lives in their natural habitat. The oldest known Flamingo in the world is about 75 years of age and resides in a zoo in Australia. They do have longer lives in captivity than in the wild, but can live for an average of 30 years in the wild.